Oct 7, 2014 1 of 1 found this helpful. Yummy Yammy is Yummy Yummy! 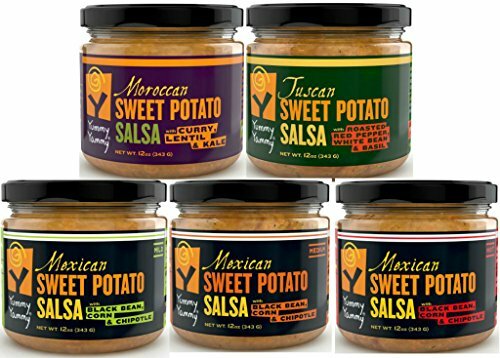 This is a must buy for salsa lovers! Who knew sweet potatoes could be so good? The whole family loves it! Yummy Yammy is the best! We counted 157 reviews for this product over the span of 1,086 days, an average of 0.1 reviews per day. If these reviews were created randomly, there would be a 99.9% chance that we would see 2 or fewer reviews on any given day. In total, we found that 69 reviews were created on just 17 days. The reviews on these high volume days have rated this product an average of 4.9 while reviews from other days have rated this product an average of 4.6. Based on our statistical modeling, the discrepancy in average rating between these two groups is significant enough to believe that the difference is not due to random chance, and may indicate that there are unnatural reviews. 114 of the 157 total reviews for this product are unverified purchases. The unverified purchasers have rated this product an average of 4.9 while the verified purchasers have rated this product an average of 4.4. Based on our statistical modeling, the discrepancy in average rating between these two groups is significant enough to believe that the difference is not due to random chance, and may indicate that there are unnatural reviews. 62 of the 157 reviewers have reviewed other products for this brand. While this is more Brand Repeaters than we'd expect to see, the discrepancy in ratings between the Brand Repeaters and non-repeaters isn't significant enough to rule out the possibility of it being due to random chance. 8 of the 157 reviewers have reviewed multiple products but half or more of their reviews are for this brand. This is an excessively large percentage of Brand Loyalists which may indicate unnatural reviews. 21 of the 157 reviewers have only reviewed this product. While this is more One-Hit Wonders than we'd expect to see, the discrepancy in ratings between the One-Hit Wonders and reviewers who have posted more than one review isn't significant enough to rule out the possibility of it being due to random chance. 40 of the 157 reviewers have never written a verified purchase review. While this is more Never-Verified Reviewers than we'd expect to see, the discrepancy in ratings between the Never-Verified Reviewers and reviewers who have written at least one verified purchase review isn't significant enough to rule out the possibility of it being due to random chance. 69 of the 157 reviewers have had at least one of their past reviews for another product deleted. The Take-Back Reviewers have rated this product an average of 4.9 while the reviewers who don't have any deleted reviews in their history have rated this product an average of 4.7. Based on our statistical modeling, the discrepancy in average rating between these two groups is significant enough to believe that the difference is not due to random chance, and may indicate that there are unnatural reviews. We discovered a total of 3 deleted reviews for this product, with an average rating of 5. Even though deleted reviews don't affect the average rating, the fact that action was taken to delete reviews raises some red flags about the integrity of the reviews for the product as whole. 16 of the 157 total reviews for this product admitted to receiving a free or discounted product in exchange for a review. While we could not find a statistically significant difference between the average rating of incentivized reviews and non-incentivized reviews, the presences of at least one incentivized review indicates that there may be more, since not all reviewers will disclose that they had received an incentive to post a review. In total, we found that 70 reviews (or 45%) are within an overrepresented word count group. While this is more reviews from overrepresented word count groups than we'd expect to see, the discrepancy in ratings between reviews with overrepresented word groups and all other reviews isn’t significant enough to rule out the possibility of it being due to random chance. 75 of the 157 total reviews for this product use substantial repetitive phrases between them. This is an excessively large percentage which may indicate unnatural reviews. In total, we found that 60 reviewers (or 38%) are within an overrepresented participation group. While this is more reviews from overrepresented participation groups than we'd expect to see, these reviews do not appear to have a significant impact on the overall rating. 32 of the 157 reviewers have substantial overlapping product review history. This is within an acceptable range and it does not appear to be significantly affecting the overall rating for this product.